This is a pair of Wedge SC Front Tires. 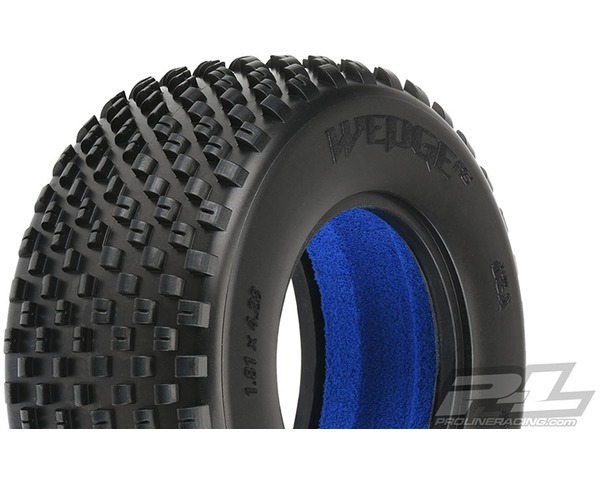 Pro-Line is ready to bring the popular Wedge tread pattern to the Short Course class! The Wedge SC is perfect for the front of your Carpet 2wd or 4wd Short Course Truck and provides just the perfect amount of steering you need without being too aggressive. The Hook shaped pins of the Wedge provide all the steering you can handle without being grabby. Pro-Lines Z compounds provide unparalleled grip on a variety of surfaces used for indoor non-dirt racing (carpet, wood, cardboard, plastic, etc. ) while still being long lasting. Be on the cutting edge of carpet tire technology with Pro-Lines new Wedge Front Tires for your Short Course Truck! All tires & wheels are sold in pairs, unless otherwise noted.